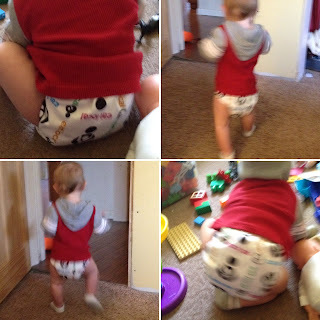 I've written on the blog several times about cloth diapering. I am kind of lazy cloth diaper-er at the moment since I have multiple littles and am pregnant but fully intend to use cloth diapers with my two youngest over the course of the next year as much as I can. I have used pocket diapers almost exclusively so I feel like I've got quite a lot of experience with them over the past two - three years. I recently had the opportunity to review an iZiv pocket diaper - more specifically a newborn organic "Eat Local" pocket diaper. A pocket diaper is made to be used with an insert - the liquid passes through the inner suede cloth into the absorbent insert inside the pocket. The outer material is a waterproof, breathable PUL fabric - which stands for Polyurethane Laminate. It has snaps along the outside of it to close and adjust it, and is stretchy around the waist and leg openings. It also comes with an insert. The diaper has easy to use snaps and is adjustable so although it says newborn in the Amazon description, you can size it to fit a child from approximately 8 - 35 pounds. 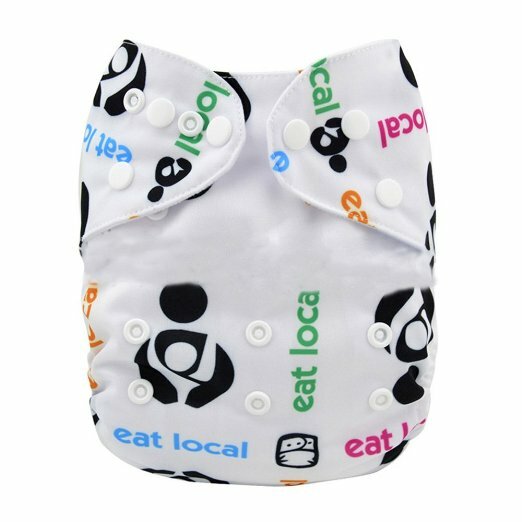 It is decorated with an adorable "Eat Local" print, perfect for breastfeeding mommas! Very cute. The material is lighter than some others I've used but it did not seem to be a problem. My 14 month old son, seen in the picture at the very top of this post and below this paragraph, has been wearing the diaper and it's been through the washer twice with no issues. Have I ever mentioned how hard it is to get a good product picture with a little guy on the run? Whew. He's a busy man! This pocket diaper sells for $9.99 on Amazon, and if you have Prime you can get it super fast. That's a pretty good deal for a diaper & insert. I attempted to do a video review on my YouTube channel - next time I'll bribe one of the kiddos into helping me film so I can show it off a little better! Disclosure: I received this product at a slight discount in order to facilitate my review. All opinions expressed are my own and I was not compensated in any other way.